While there are many countries in the world that surely deserve your visit, one of the countries that have been attracting more and more people is Indonesia. Indeed, Indonesia, and Bali in particular, is a truly beautiful country. When you are looking for the perfect destination to relax after one year of hard work, you should definitely consider Bali. However, one of the issues that many tourists are starting to complain about is the increasing traffic. The reality is that it seems impossible to conveniently drive in Bali, especially during the hottest months. So, when you want to go to the beach, it may take you forever. But don’t fret! It doesn’t have to be this way. In fact, you don’t even need to wake up earlier either to ensure that you don’t waste your time on traffic. All you need to do is to take advantage of Bali’s new electric scooters; or skutis as they are known in Indonesia. 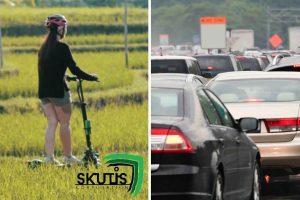 While you may have never heard about skutis before, the truth is that they are the latest go green trend. After all, we are all concerned about the global warming and how it can affect us. In addition, Bali is still one of the places that you can visit to enjoy fresh and pure air. So, why ruining it? In case you are considering to go to Kuta, you may find the traffic even more chaotic. After all, Kuta is known for its beautiful and exciting beaches which keep attracting a lot of people. So, Skutis Tours Bali just formed a new partnership with Sandbar and Seacrets in Kuta, and they are now renting out skutis for everyone. Simply put, a skutis is a foldable and fully electric kick-scooter that is extremely light and allows you to move quickly around Kuta at any time of the day and night. Can you imagine riding a skutis and getting to know all of Kuta’s hidden places, while getting cooled down by a fresh sea breeze? You can be sure that you’ll love this experience. One of the best things about doing business with Skutis Tours Bali is that you can also take advantage of a guided sightseeing tour in Bali and discover more about the beauty of Indonesia. While you may have read all about it, the reality is that there are some special spots that you will only be able to see in case you go on a guided tour in Bali. And can you think about a better way of doing it than on going by skutis? Before the tour starts, you will get a short riding training session where you will learn how to ride your own skutis. Then, you just need to choose the tour that you prefer. If you’re more adventurous, just choose this type of tour; in case you want to see the main Bali attractions and some of the hidden traditional and cultural places, just go on a tour that is more relaxed and focused on sightseeing. With so many different companies offering you different kinds of tours in Bali, Skutis Tours Bali is the only company that allows you to do it riding your own skutis in Bali. So, just go green and try it out. Whether you ride to the beach, go for a cruise, or opt for a tour, you’ll have a lot of fun for sure.